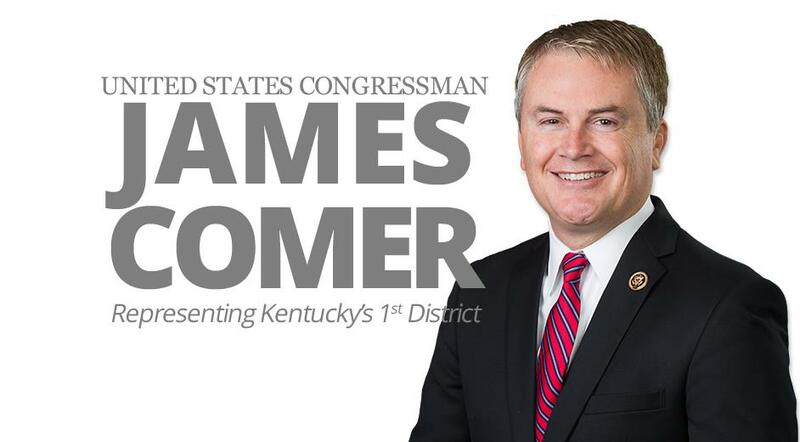 Congressman James Comer has been named the top Republican of two House Subcommittees for the 116th Congress: The Oversight and Reform Committee’s Subcommittee on the Environment, and the Education and Labor Committee’s Subcommittee on Civil Rights and Human Services. Comer represents Logan and Todd counties along with much of western Kentucky in Congress. He announced this week that he won’t challenge Kentucky’s highly controversial governor, Matt Bevin, in the Republican gubernatorial race this spring. Oversight and Reform’s Subcommittee on Environment will conduct oversight on a number of issues including public health, environment protection, international agreements and energy policy. Congressman Comer will have a significant role in helping oversee regulatory affairs and federal paperwork reduction legislation. Education and Labor’s Subcommittee on Civil Rights and Human Services includes jurisdiction over a variety of matters related to equal employment opportunities and civil rights, adolescent development programs, care and treatment of at-risk youth and child adoption. The subcommittee also includes some agriculture jurisdiction, including the school lunch program and the Special Supplemental Nutrition Program for Women, Infants, and Children (WIC). “I’m excited to take on the role of serving as Ranking Republican of two important subcommittees. I feel like I proved my abilities as a freshmen member of Congress, and now I’m eager to get the opportunity to lead,” Congressman Comer said.